Most everybody in the region is now aware that the 2017 Ford Explorer offers up some of the most exciting specs around, from a wealth of performance features and technologies to one of the most stunningly designed exteriors currently on the market. However, what you may not know is that the new Explorer also comes embedded with a slew of safety features that are designed to keep you and everybody else as safe as possible during the drive. From Enhanced Active Park Assist and Lane Keeping System to a selection of reliable airbags, the question isn’t what the Explorer offers you — it’s what doesn’t it offer you. Get the details by reading on before your test drive appointment! An Enhanced Active Park Assist makes parallel parking easier than ever by helping you navigate the tightest of spaces and transforming the control you have over your vehicle. The Explorer’s Lane-Keeping System prevents highway drift by indicating to you when you’ve begun to shift from one lane to another and helping you better correct for mistakes on the open road. With its Front 180-Degree Camera and Front Park Aid systems, the Explorer gives you a comprehensive image of the area surrounding your Explorer, making the process of parking simpler than ever, while also giving you a dependable device to alert you to impediments in front of your car, enabling you to better negotiate tight spots. Finally, the Explorer comes with a reliable assemblage of airbags—ranging from front impact to knee airbags and overhead airbags—encasing you and your passengers in a web of protection throughout the drive. This system helps guarantee that whether you’re careening down the highway or driving through one of the summer’s coming storms, your Explorer is going to be able to keep you stable and secure. Perhaps it will come as no surprise, then, that the Explorer has received a 5-star overall safety rating from the NHTSA—it’s highest rating—thus ensuring that you’re going to be getting dependable safety no matter where you are. 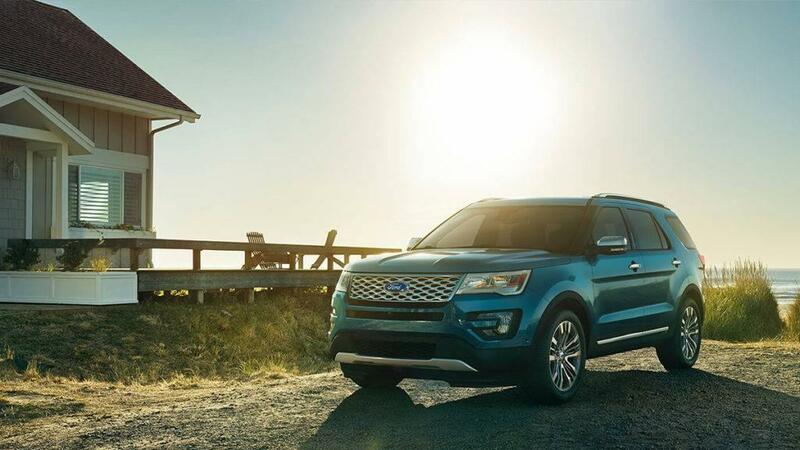 Best of all, you can take any of the new Ford Explorer trims out for a test drive yourself. Simply stop by our Glenwood Springs Ford dealership, and we’ll get you out on the road in no time whatsoever. Oh, and by the way: while you’re at it, you should be sure also to check out our financing options. Then, get in touch via this easy-to-use online form, and we’ll be sure to get back to you ASAP! We look forward to hearing from you soon at Glenwood Springs Ford!